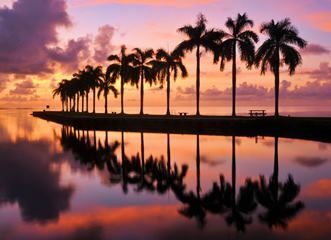 Description:Join Cosmos on this sun-soaked tour around Florida, including the state’s east and west coasts and the Florida Keys. Your tour begins and ends in Orlando with overnights also in Cocoa Beach, Miami Beach, Key West, Fort Myers, and Clearwater Beach. Along the way, stroll on the white-sand beaches, enjoy gorgeous sunsets, and feel the sun drain away tension as you sit back, relax, and let Cosmos handle the details and the driving! On this Florida tour, you’ll spend time in St. Augustine, the oldest city in the United States. You’ll also visit Cape Canaveral and the Kennedy Space Center, where you’ll learn about America’s space program during your NASA tour. In Fort Myers, visit the winter homes of Thomas Edison and Henry Ford. As good friends, they had winter homes next to each other, including 20 acres of botanical gardens. Your time in Miami Beach includes an excursion to South Beach, where you can explore the beaches and meander through art galleries. A highlight of this tour is the ride you’ll take on an airboat through the swamplands in the Everglades, the largest subtropical wilderness in the United States. Keep an eye out for sleepy alligators basking on the banks of the waterways. But that’s not all…also enjoy the drive to picturesque Key West, which crosses over 42 bridges. In Key West, you’ll have plenty of free time to explore the town. Be sure to capture the beautiful sunset! Finally, you’ll enjoy free time in Clearwater Beach, one of Florida’s most popular resort cities. Relax on the sugar-white sands and take advantage of warm-weather activities. Gorgeous beaches, interesting experiences, and striking scenery…this Florida tour designed for value-minded travelers has it all! In Miami; Key West guided train ride, Kennedy Space Centre, airboat tour through the Everglades, Thomas Edison's Winter Home, and Henry Ford's Winter Home. Florida's Atlantic coast, Gold Coast, Miami Beach, Florida Keys, Key West, Everglades National Park, Gulf Coast shoreline, and Clearwater Beach. AWelcome to Orlando! Your Tour Director is on hand late this afternoon to answer any questions. Day 2 / Orlando-St. Augustine-Cocoa Beach. Day 3 / Cocoa Beach-Cape Canaveral- Miami Beach. Cape Canaveral and the KENNEDY SPACE centre are the hub of America's space operations. Enjoy a NASA tour for insight into the achievements of America's space program. Afterward, head south to Miami Beach. Day 4 / Miami Beach. This morning, you have the option to choose a Miami city sightseeing tour that highlights famous Ocean Drive, South Beach, and Little Havana. If you prefer, spend the day in the highly sought-after South Beach exploring the beaches or meandering through art galleries, boutiques, restaurants, and enjoying the Florida sun. Your Tour Director will have other suggestions for spending your time. Day 5 / Miami Beach-Key West. Day 6 / Key West. Day 7 / Key West-Everglades-Fort Myers. Day 8 / Fort Myers-Clearwater Beach. Visit famous inventor THOMAS EDISON'S WINTER HOME & LABORATORY. Step through the always-open "Friendship Gate" to visit HENRY FORD'S WINTER HOME. Don't miss the enormous banyan tree in the garden. Day 9 / Clearwater Beach. Day 10 / Clearwater Beach. Day 11 / Clearwater Beach. Day 12 / Clearwater Beach-Tampa. Price is per person twin share for travel on the 5th of October 2018. Prices listed include all discounts unless otherwise stated. Prices correct as of 10 April 2018. Payments made by credit card will incur a surcharge. Visas and airfares are not included. Other travel conditions may apply, contact our travel team for more details.